AOL needed an innovative way to promote a range of new applications from About.me to Pricecheck.com as new solutions to common digital problems. 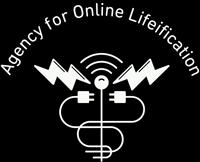 We came up with the the Agency for Online Lifeification (AOL), a treatment center for digital detoxification offering a range of treatments for modern computing ailments. Manifold designed the campaign and we wrote, directed, and produced the videos -- three case studies of AOL patients, three corresponding 15-second spots, and a 30-second intro video -- starring some of our favorite talent: Tom Poarch, Rob Hugel, Kate Costello, and Luis Vega.